The subtle two-toned elegance of this Michele watch from the Deco II collection will elevate any style. 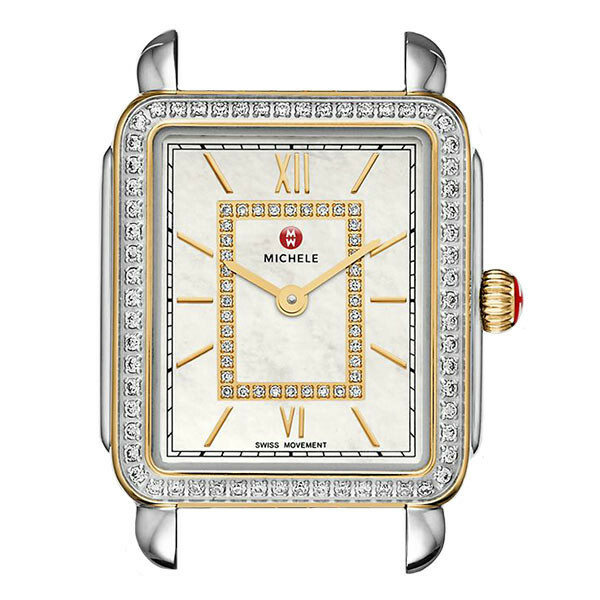 The bezel of the stainless steel case is embellished with a single row of white diamonds, and the edges of either side of the channel are layered with yellow gold. Golden markers pop against the mother-of-pearl dial adding to its beauty. Add a 16mm bracelet or interchangeable watch strap (sold separately) to get a look that right for you. Michele watches accentuate any outfit fabulously. JR Dunn has a 10-day satisfaction guarantee for all Michele watch products.